Michael O'Connell was all in with [Ac][7s] and was up against his opponent's [Jh][Jd]. The board ran out [Td][9d][3c][9s][9c] and Michael could not find an ace to survive. He will collect $16,000 for his 2nd place finish. 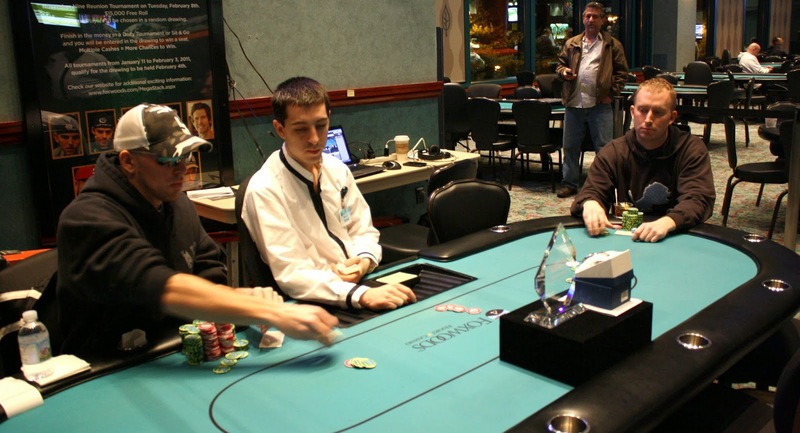 Michael turned a huge profit as he satellited into the tournament on a $60 satellite. That's a 26,600% ROI! 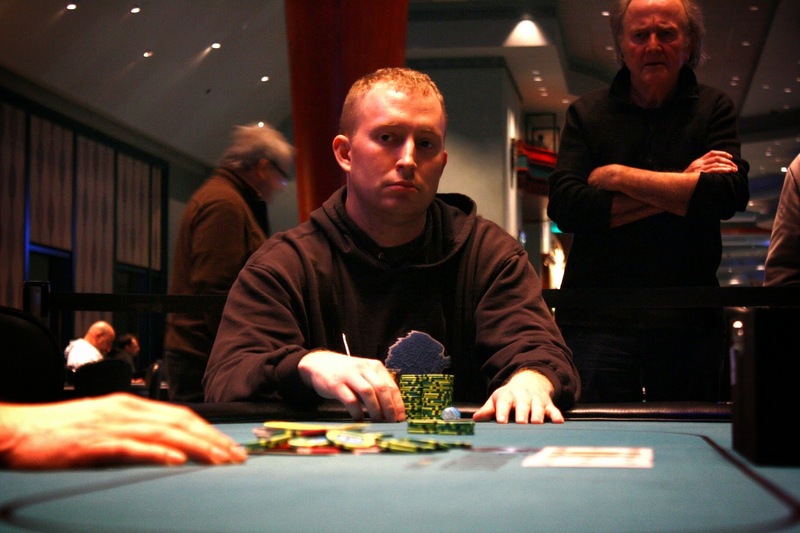 It was a preflop cooler as Michael O'Connell with [Kh][Kc] against his opponent's [Ac][Qs]. The board ran out [Th][Jc][3s][Js][2h] to give Michael the doubleup. The two players are now nearly even in chips. 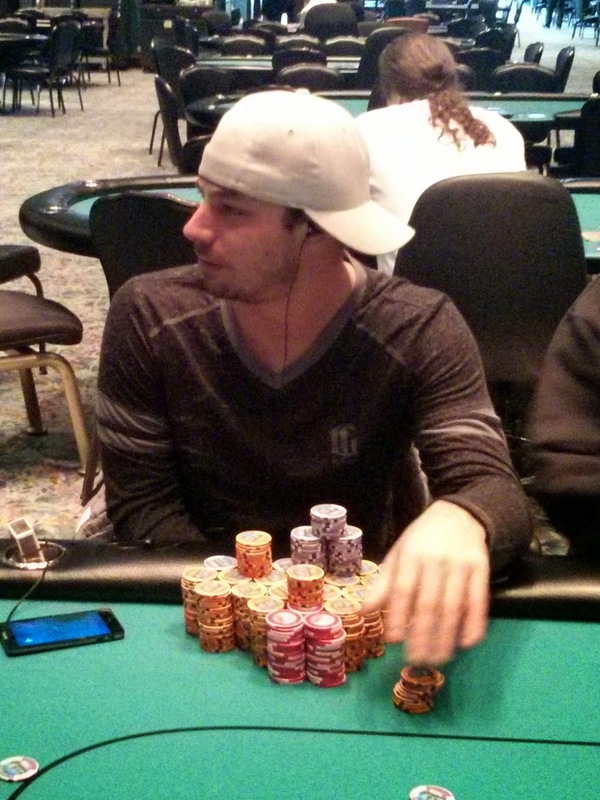 Ryan Eriquezzo was all in preflop with [Ad][Qh] and was flipping against his opponent's [Jd][Jc]. The board ran out [2c][7d][Kc][9c][9h] and Ryan failed to pair one of his hole cards. He will exit this tournament in 3rd place, good for $10,844. 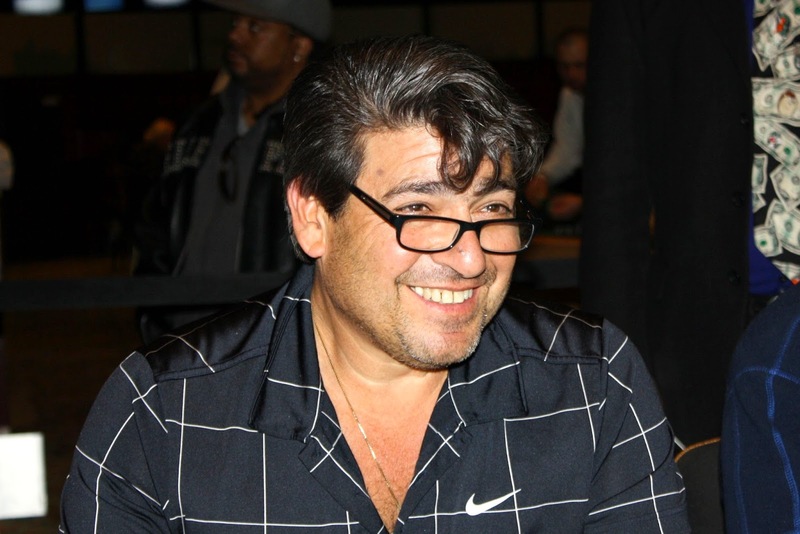 Michael O'Connell moved all in under the gun and Leonidas Gialelis called all in for less. Both other players got out of the way, and Leonidas tabled his [Qs][Qd], which was well ahead of Michael's [8h][7h]. The [Th][4h][Kd] flop gave Leonidas a bit of a sweat, but the [3c] kept the queens in front. 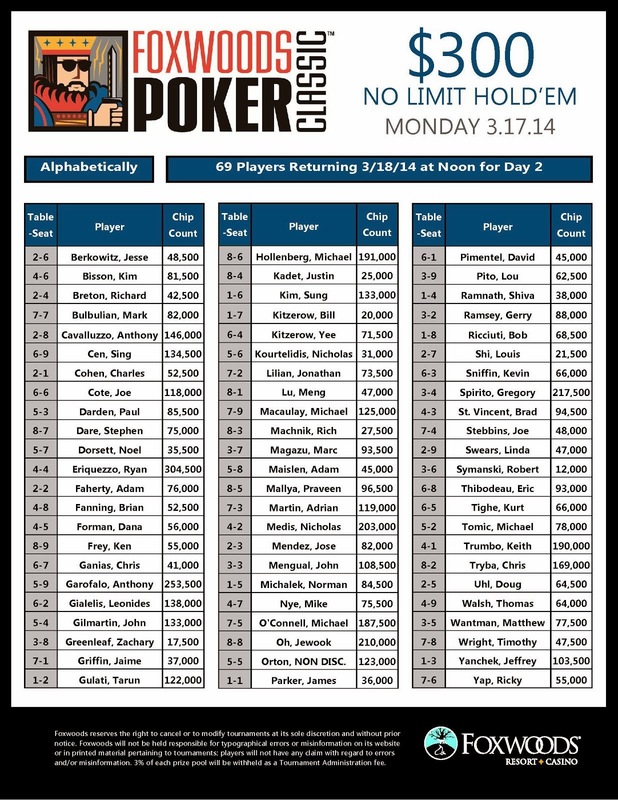 It was the [2h] river that did it... making Michael's flush and eliminating Leonidas in 4th place. Leonidas will collect $7,325 for his efforts. 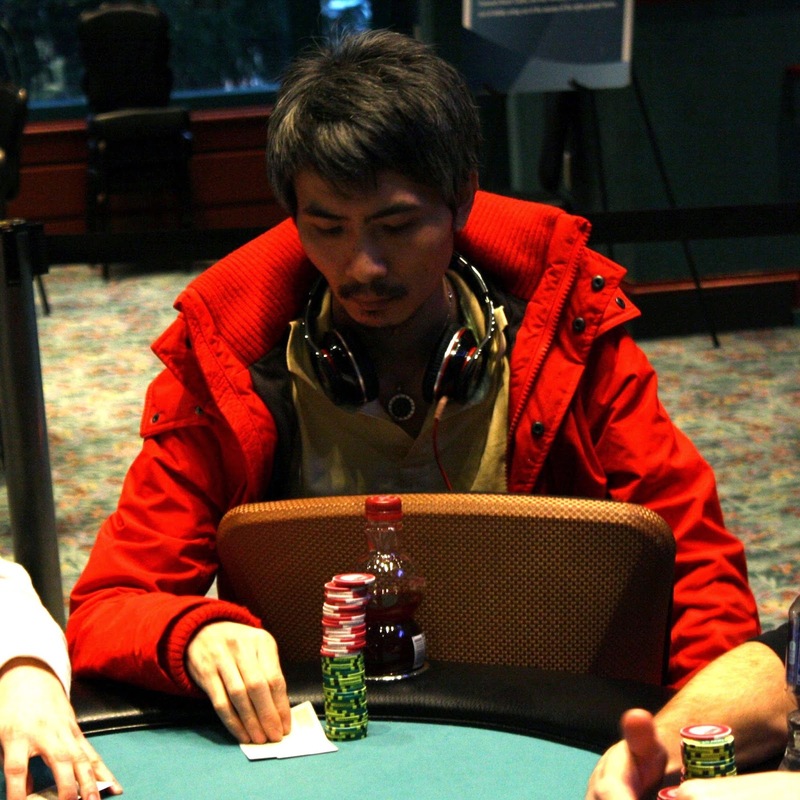 Je Wook Oh has been eliminated in 5th place when he ran his ace nine into the pocket aces of Ryan Eriquezzo. Je Wook will collect $5,455 for his efforts. 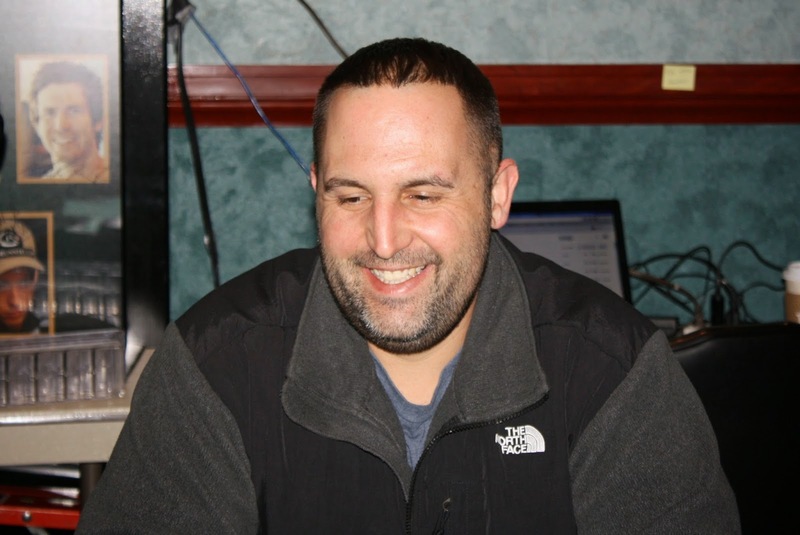 Six handed, action folded to Nicholas Medis on the button, and he moved all in. Leonidas Gialelis snap called in the big blind and tabled [Qh][Qd], which was well ahead of Nicholas's [9c][7c]. 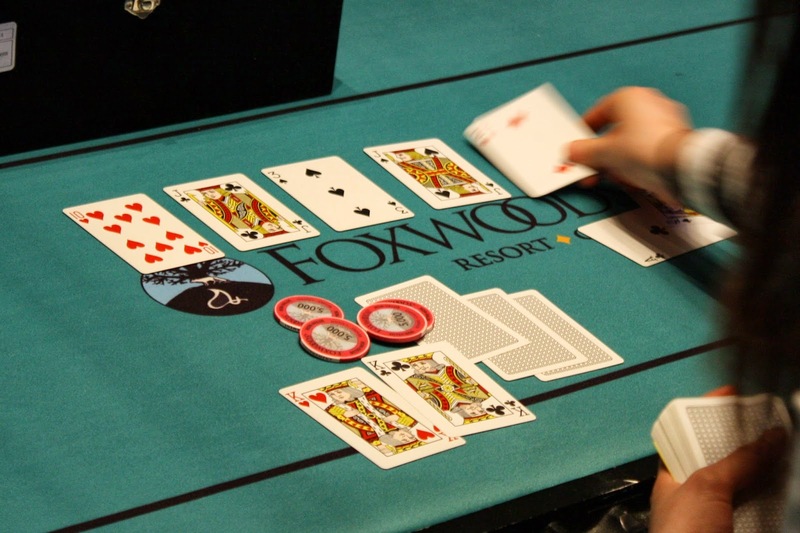 The flop came out [As][Qh][2c], and Nicholas would need to catch runner runner clubs to survive. The [Ac] that fell on the turn was not the club he was looking for, as Leonidas now had an unbeatable full house. 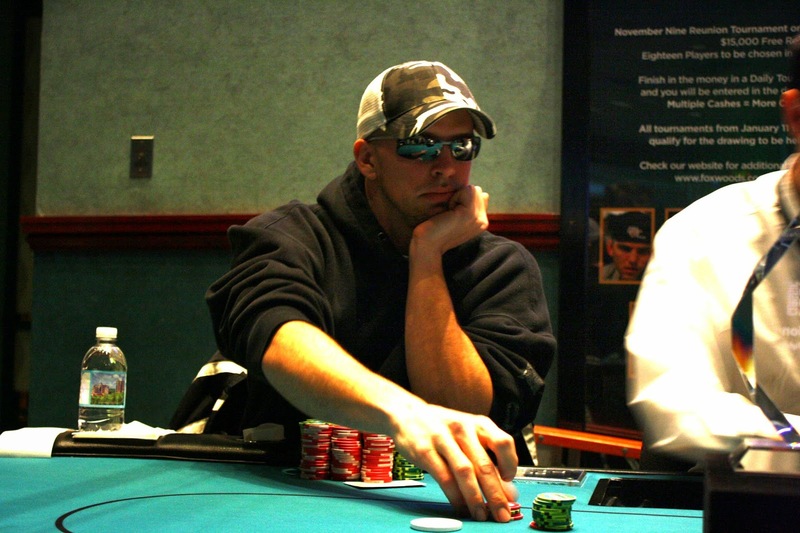 The meaningless [6h] hit the river to send Nicholas to the rail in 6th place, earning $4,416 for his efforts. 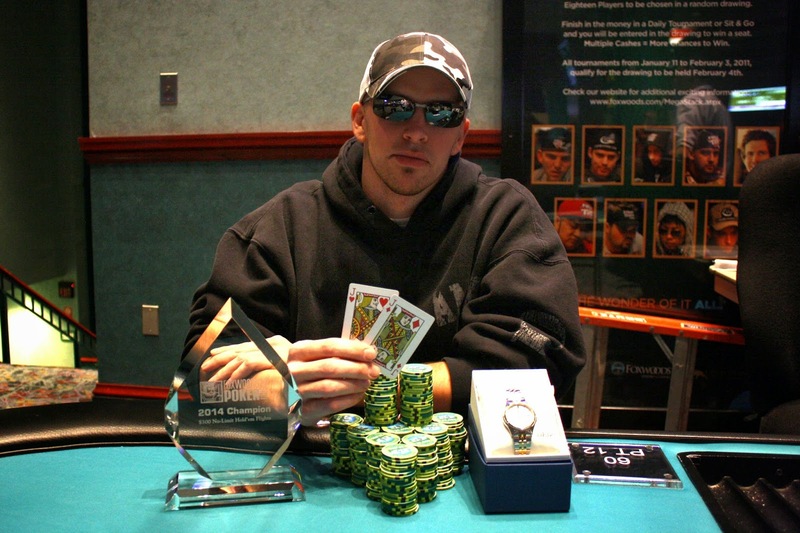 Jeffrey Yancheck was all in and in great shape to double up, holding [Ac][Td] against Ryan Eriquezzo's [Jd][Th]. Ryan had been on a hot streak, though, and told Jeffrey, "Sorry about this" before the flop came out. As if knowing the fate of the cards, Ryan outflopped his opponent when it came [Jc][Kh][3d]. Jeffrey had outs, though, and he had two chances to hit one. 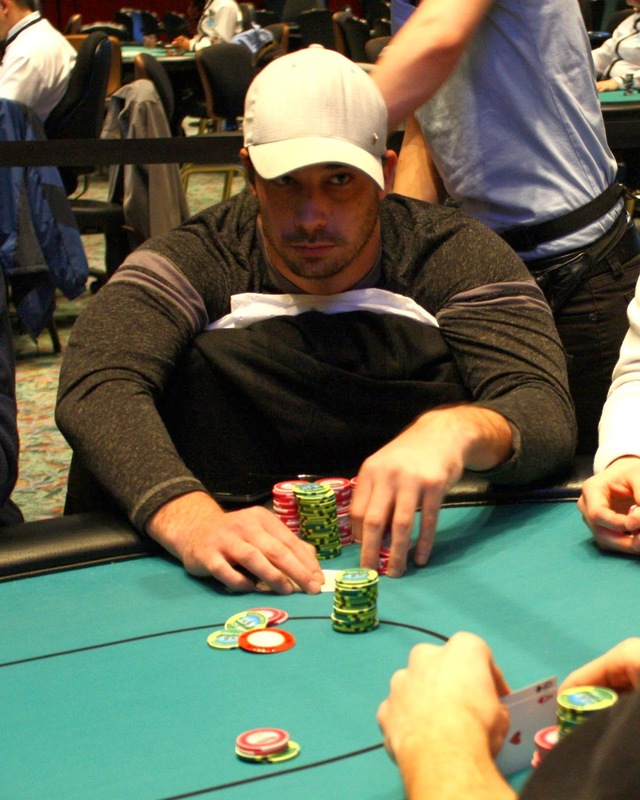 The [3s] turn and [5h] river could not save him, however, and Jeffrey will exit this final table in 7th place, good for $3,533. On a [5c][5d][Jh] flop, Charles Cohen moved all in and was snap called by his opponent, who tabled [As][Jc]. Charles said, "Well I guess I'm out" before sheepishly turning over [Ad][3c]. The [4h] turn gave life to Charles as he went from zero outs to four, but even after rooting heartily for a deuce, it did not come. Instead, the [Qc] landed on the river to send Charles to the payout desk. 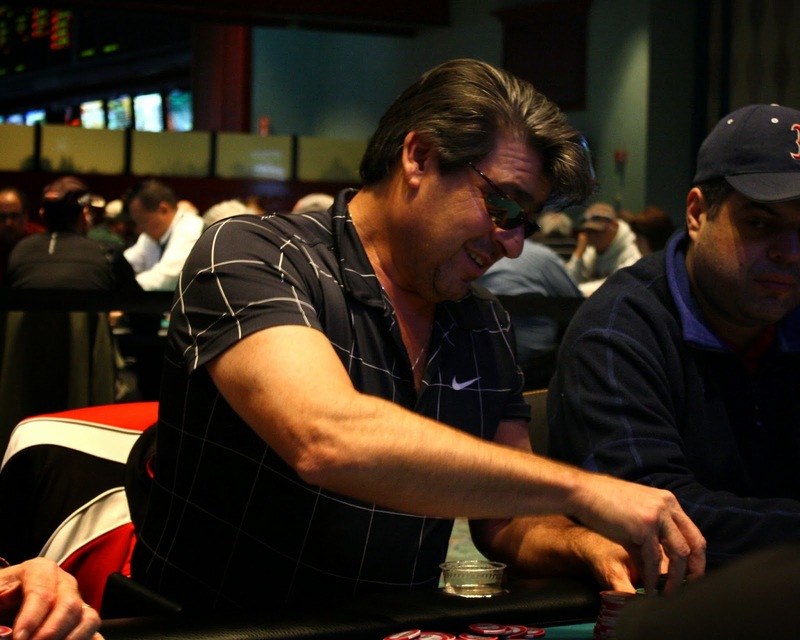 He will earn $2,754 for his 8th place finish. 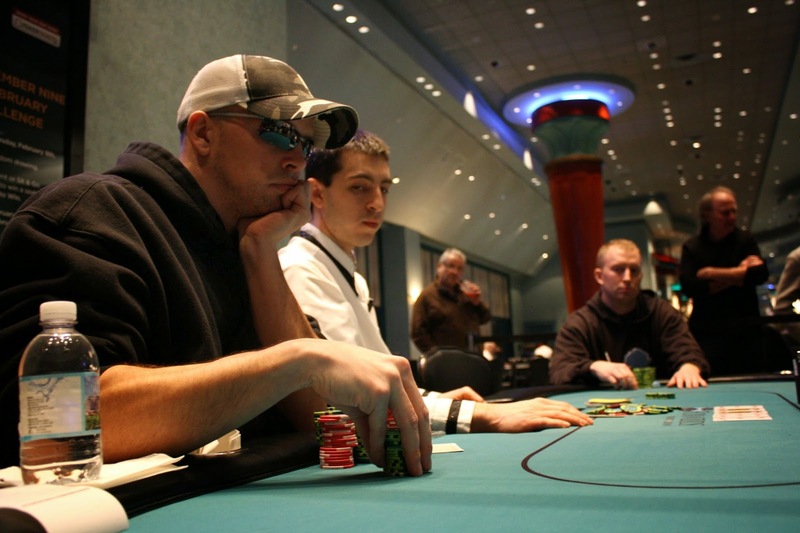 At 15,000/30,000 blinds, Ryan Eriquezzo opened to 60,000 before the 10 seat called. 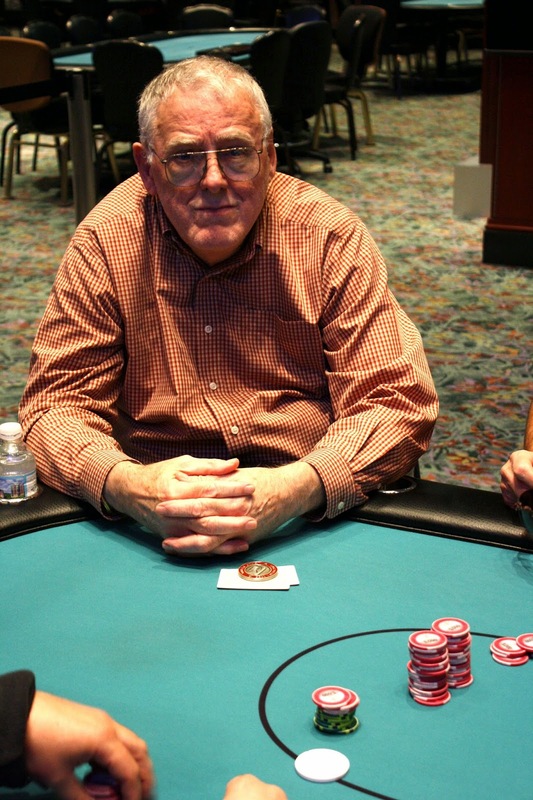 Action folded to Joe Cote in the big blind who moved in for just over 400,000. After asking for a count, Ryan re-shoved and got a tank fold from the 10 seat, who mucked [Ah][Qs] face up. Joe would need to catch a ten to survive, but it did not come as the board ran out [8d][4s][As][6c][8c]. 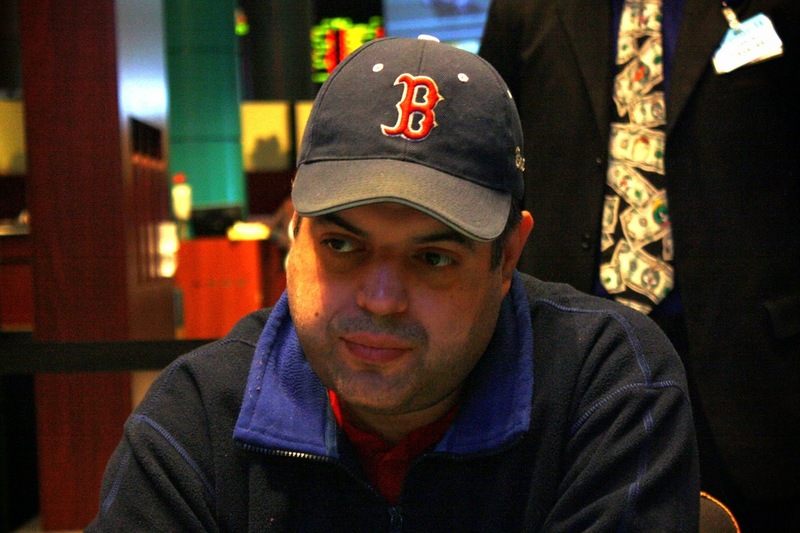 For his 9th place finish, Joe will earn $2,143. On a [Qh][Js][6c][9h] board, Ryan Eriquezzo moves all in with [Kd][Kc] and gets a call from Charles Cohen who holds [Ts][9s]. Charles has eight outs to eliminate Ryan, but the [4h] river is not one of them. 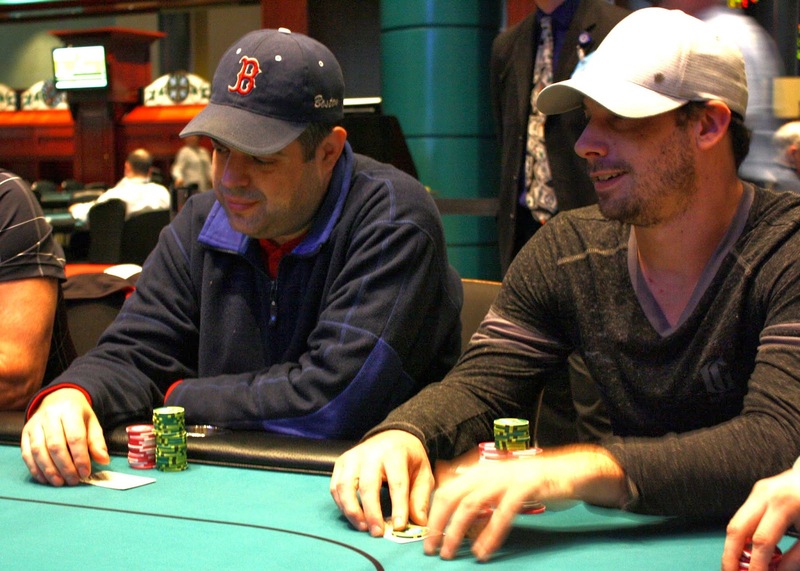 Ryan seems surprised that his 82% favorite held up, and he scoops this giant pot. Ryan now sits on over 1,300,000. On the last hand before dinner break, Je Wook Oh was all in with A-Q against Michael O'Connell's pocket sixes. Je Wook flopped a queen to earn the double-up. 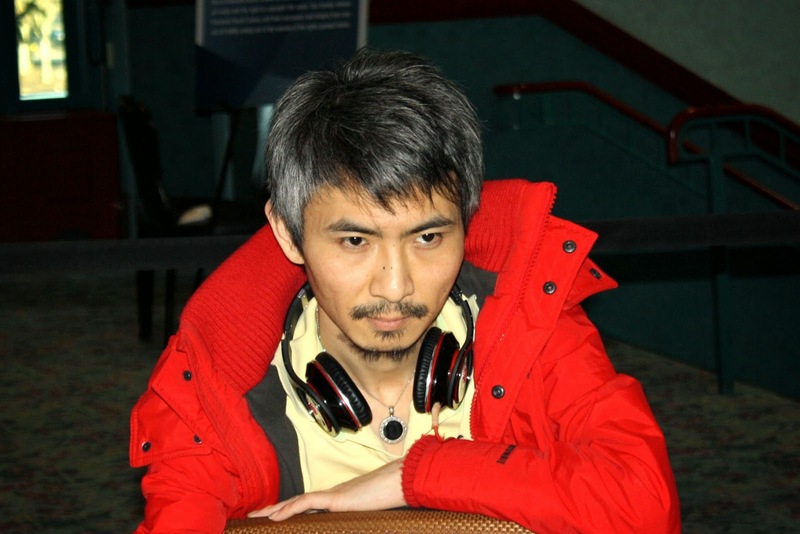 After the hand, Je Wook had 524,000 while Michael dropped to 1,250,000. 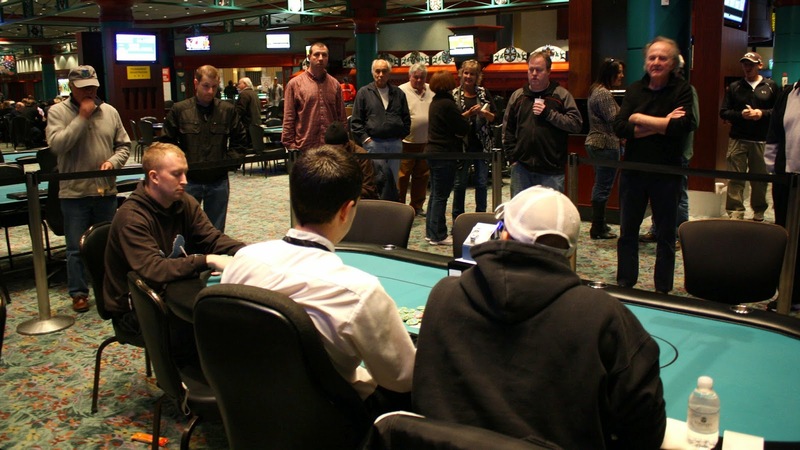 The nine remaining players are now on a 45 minute dinner break. Play will resume at approximately 6:50pm. 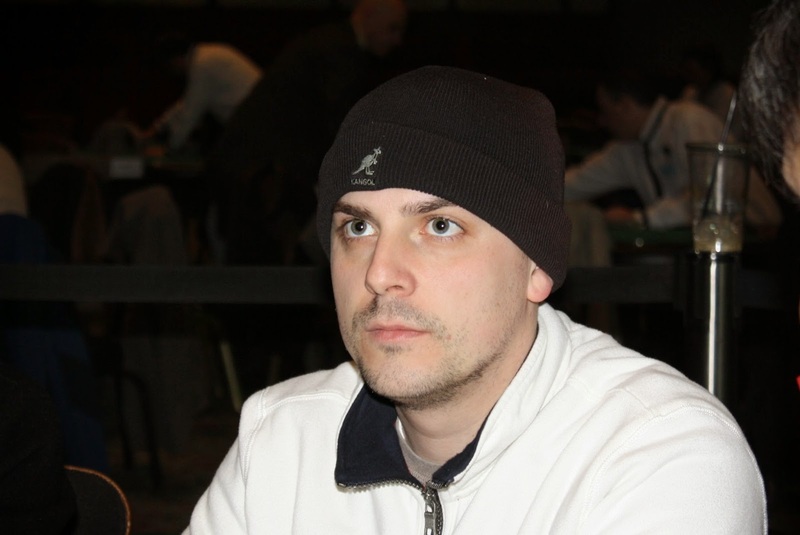 Marc Magazu was all in with [7h][7c] and was behind his opponent's [9h][9c]. Marc would need to catch a seven to stay alive, but the [Ac][9s][Kd] left Marc all but drawing dead. He would need both sevens to come out to stave off eliminations, but the [5d] turn left him drawing dead. 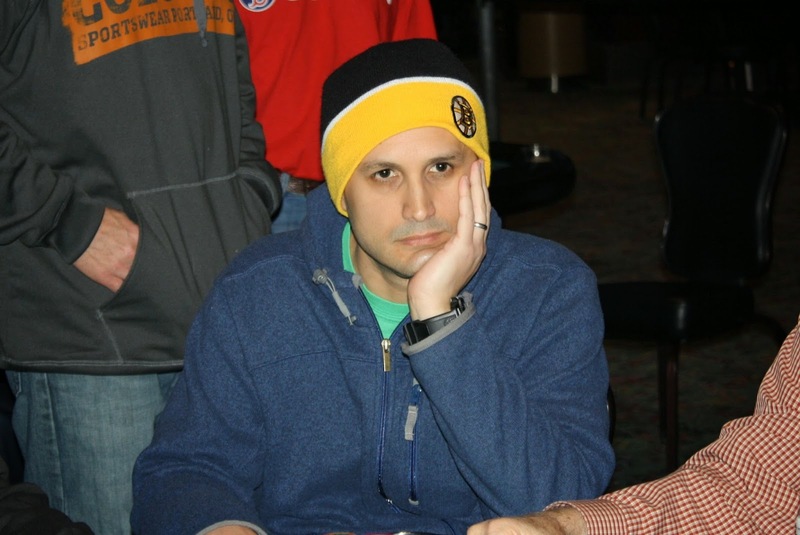 The meaningless [4s] hit the river, sending Marc to the payout desk to collect his $1,610 for 10th place. 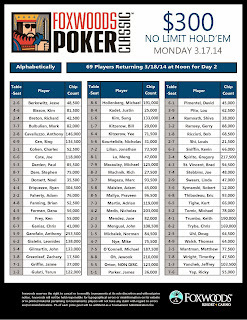 With the elimination of our 46th place finisher, the remaining 45 players are now in the money. 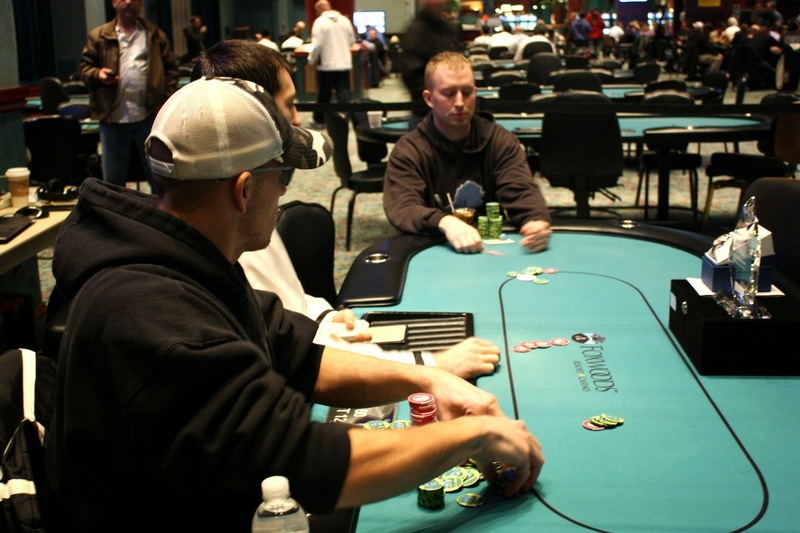 Each player is guaranteed $623 while all eyes are on the $22,517 first place prize. 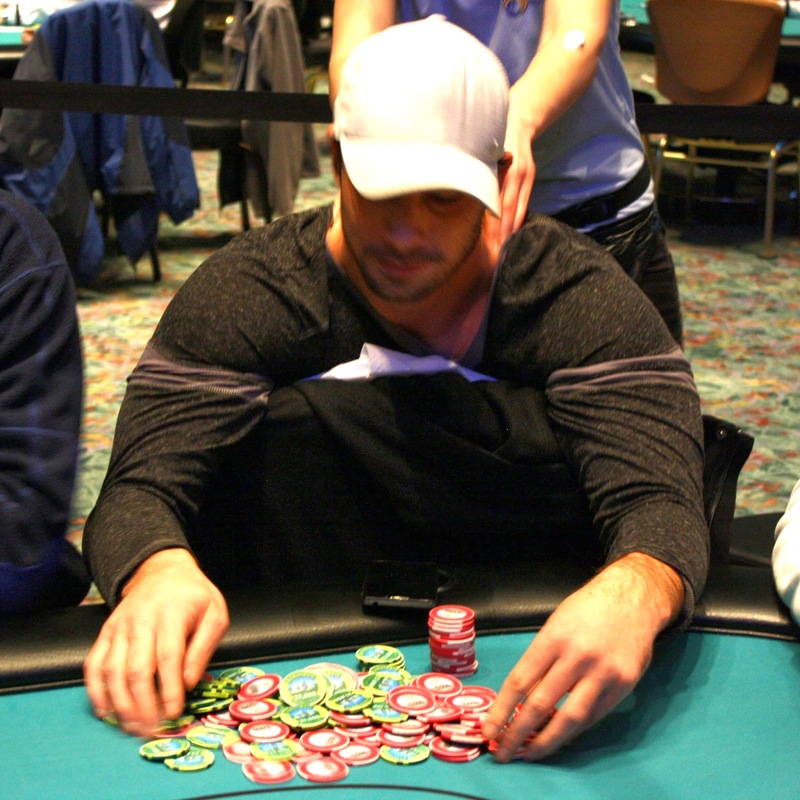 Ryan Eriquezzo came into Day 2 as the chip leader with 304,500, and he has maintained his lead. 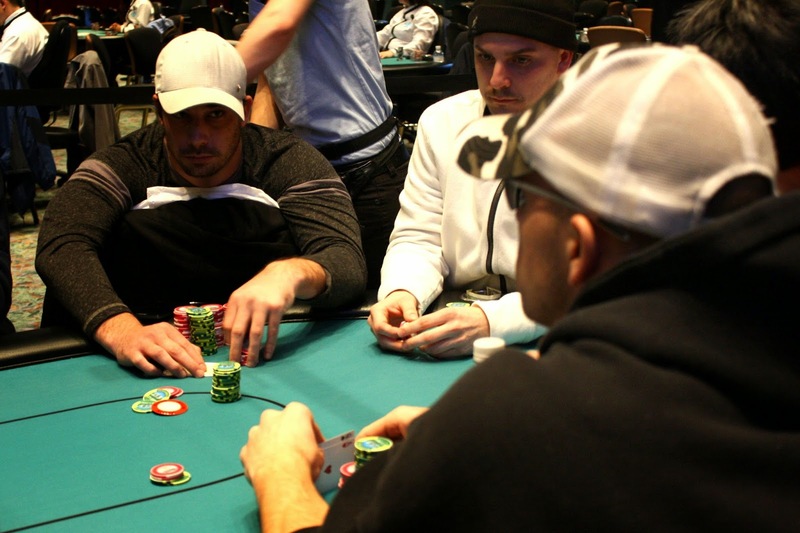 Ryan has more than doubled his stack already and currently sits on approximately 680,000. 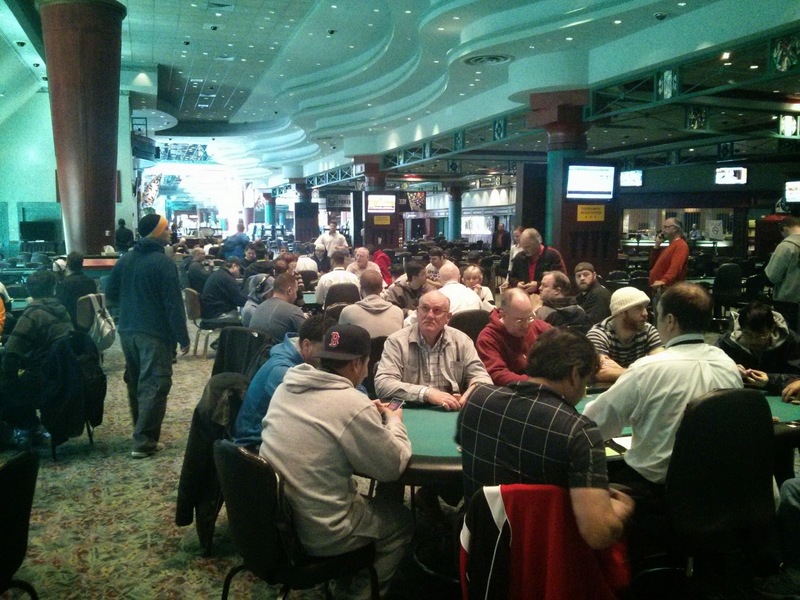 Players have unbagged their chips and taken their seats, and cards are in the air for Day 2 of Event #15. 69 players remain, and the top 45 players will get paid. This tournament will play down to a winner tonight. With 10 minutes left in Level 15, the clock has been paused and a card has been drawn. 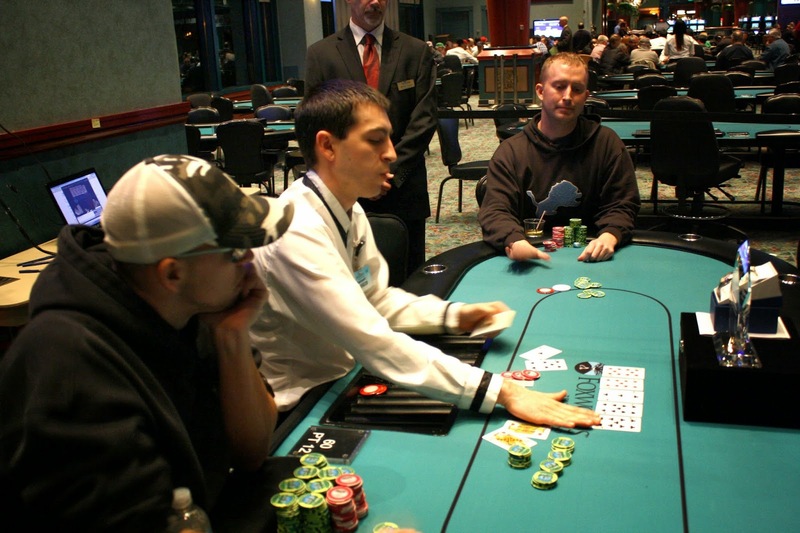 Players will play 5 more hands before bagging up for the night. 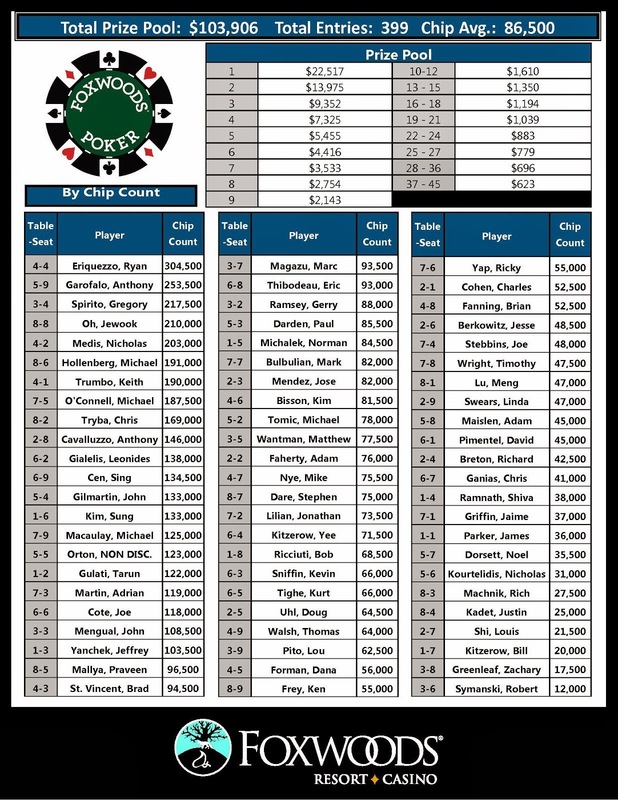 The board reads 39 remaining players, so those that make it through these additional hands will join the 35 players from Flight A at 12pm to play down to a winner. 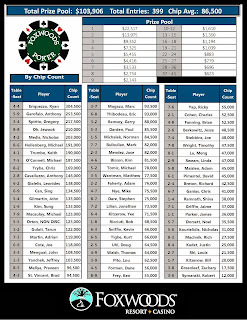 Full chip counts and seating assignments for Day 2 will be posted here shortly.